Soil amendments are elements added to the soil, such as natural fertilizer, peat moss, manure, or chemical fertilizer, to improve its capacity to support plant life. While chemical fertilizer improves soil by adding nutrients only, soil amendments such as peat moss and compost improve soil by making its texture or drainage better for plant health. Peat moss adds no nutrients to soil. Meanwhile, compost enhances the ground in which you plant both through adding nutrients and through improving texture and drainage. Compost, peat moss, and landscape mulch all help your soil to retain water better. Soil amendments can also change soil pH. For example, peat moss is acidic, which makes it suitable for use around acid-loving plants. "Peat moss" refers to a type of moss known as sphagnum moss. Sphagnum moss is a spongy material that was also traditionally used to chink log cabins. This spongy character gives you a clue as to one of the virtues of peat moss as a soil amendment; it retains water well, yet it does not become compacted. Amend your soil with peat moss to achieve "Goldilocks" drainage: not too dry, not too wet. This soil amendment is harvested, or "mined", from peat bogs (Canada is a major producer). A bog is a type of wetland. If you are familiar with water gardens, you may know that there is a whole class of water-garden plants known as "bog" plants. The sphagnum moss decomposed in these peat bogs over very long periods of time, meaning that, for practical purposes, peat moss is not a renewable resource. This is one reason why some people are against the continued use of peat moss. It is used widely in the green industry. Peat moss is one of the typical ingredients used in potting soil, along with compost and, to improve drainage, perlite. If you will be starting a new garden from scratch for the first time in your life, one of your first steps should be to learn how to make compost. This is because it is likely that, when opening up new ground for a garden, you will have to improve the existing soil. A soil amendment, by definition, is just the thing you need for such a task, and compost is the ultimate soil amendment. Among its other virtues, a great thing about compost is that, unlike peat moss, you can make your own. One of the first tasks in making compost is to set up some type of compost bin. There are many kinds of bins. Some types have cylinders that you can spin around so that you do not have to turn the contents with a pitchfork. Another advantage of this so-called "tumbler" style is that it is cleaner, which is an important consideration for those worried about keeping rats out of their compost bins. A compost bin really does not have to be fancy to be effective. It is, after all, simply a container. The purpose of this container is mainly to make it easier for you to keep the composting materials nestled together and to keep excessive rain off them. When not properly stacked and maintained in a pile, the materials, although they will eventually break down, will take much longer to do so. The mass of a properly formed pile is critical to fast decomposition. The materials just don’t cook as well if not massed together so as to form a pile of at least 3 feet x 3 feet x 3 feet. Homemade compost containers can be built in all sorts of different ways. One often sees some combination of chicken-wire fencing, cinder blocks, wooden planks, or pallets, for example, used to make compost bins. As great a soil amendment as compost is, it is surprisingly easy to make. Nature does it all the time. When unaided by you, nature takes a long time. The basic idea is to stack compostable materials in layers in the compost bin, then keep the pile adequately watered. The right mix of materials and the correct amount of watering will put microorganisms to work for you, to break down the pile. Turn the pile occasionally. The pile will heat up, and the materials will decompose. 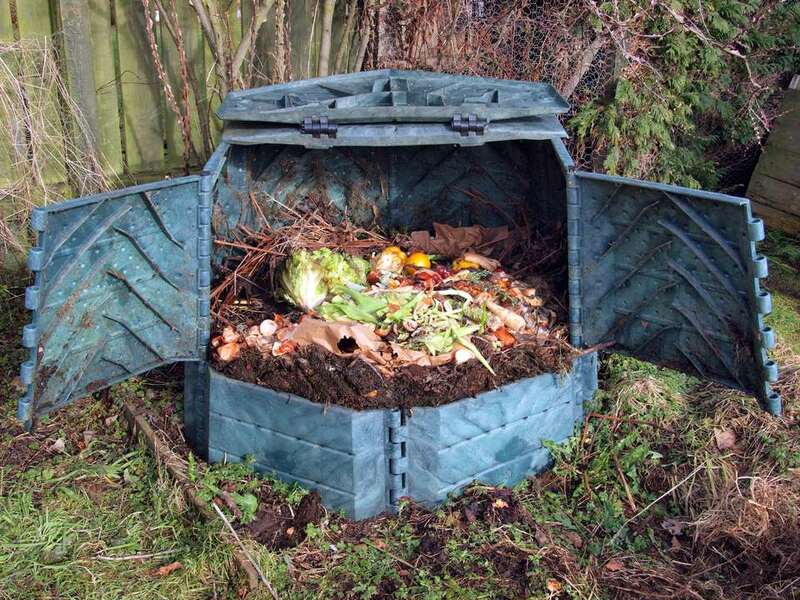 What materials can you put in a compost bin? If a material is natural and it breaks down (that is, decomposes), then it is a possible candidate for your compost bin. But not all such materials are created equal. Let's start with some obvious examples of good and not-so-good materials to use in your compost bin. You can compost manure (from cows, horses, chickens, etc.). In fact, it is often better to use composted, or "aged" manure in the garden than the fresh product. The latter is sometimes so hot that it burns plants. It is not such a good idea to use cat poop, though, as it contains pathogens. Many gardeners also avoid using meat scraps. You can make compost the ultra-serious way, or you can make compost in a more casual way. Let’s assume you will take the latter approach, but it will still be helpful for you to know that those who are ultra-serious speak of something called a carbon-nitrogen ratio. 30:1 has sometimes been deemed the ideal ratio of carbon to nitrogen. It’s a lot of trouble to try to get an exact ratio. Frankly, most of us wouldn’t even know how to measure such a thing with any degree of exactitude. The leaves that you rake up in autumn (it is best to shred them first by running your lawn mower over them). Clover and grass clippings left behind after mowing. Potato peelings and similar kitchen scraps. Experiment with the proportions. Rather than seeking that exact 30:1 ratio in a rigorous, scientific way, you’ll probably discover what works best over the course of time by observing how well or poorly different mixes decompose. Once your layers are in place, the microorganisms do most of the rest of the work (worms help, too). You need to help them out by watering the pile once in a while. There’s a delicate balance to find between letting the materials dry out and making them soggy. You don’t want either of those extremes. You can also help out the microorganisms by turning the pile once in a while with a pitchfork (or by tumbling if you have a tumbler-style bin), to keep the pile well-aerated. Turning also makes the materials break down in a more uniform way. The center of the pile is where the action (heat) is. The idea behind turning the pile is to move some of the material around the edges into the center, so as to give it equal time to cook. When the materials have broken down completely, you are almost ready to put to use the world's best soil amendment. Adding soil amendments can improve your soil no matter what type of soil you have. It can solve the problem of, for example, an overly sandy soil that does not retain enough water, or an overly clayey soil that, on the contrary, retains too much moisture. You should also be amending the soil right along as part of a garden's preventive care regimen, even in the absence of known problems. Well-fed plants are more likely to ward off plant diseases and withstand insect-pest invasions. Most gardeners who tend compost piles distribute mature compost to at least some of their plants annually.